I‘ve been eating some nice lunches over the past few weeks. I though I’d share a couple of them with you. First is what I call my “Italian club sandwich.” I suspect the idea of a club sandwich is rather unknown in Italy, but here in North America we can call anything “Italian” as long as it has some Italian sounding ingredients. So be it. My version was a triple-decker, although next time I’ll not bother with the middle slice. It used a pretty standard whole wheat bread (toasted) dabbed with a bit of Hellman’s mayo (not too much!) that has been lightly infused with a bit of Dijon mustard. To be precise, the bottom layer used the mix. The middle layer was straight mayo. 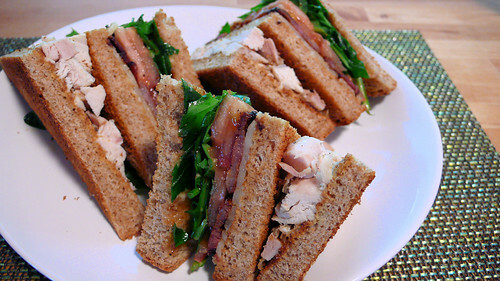 You may notice there are only three segments to this finely quartered sandwich. That’s because I ate a segment before declaring it so good I need to photograph it. 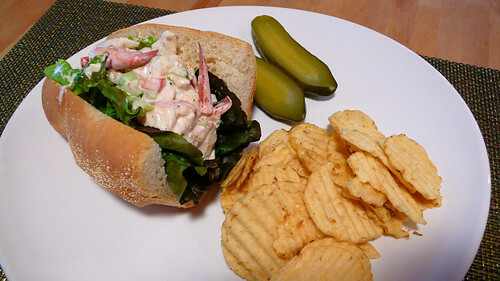 I followed a pretty standard New England lobster roll method, with the exception that I used a bigger roll instead of the soft hot dog bun that one finds used along that coast. Note however that whatever you use, it is important to use a soft bun; a dense or overly crispy bun will completely ruin the experience. In my case it was simply a matter of combining the freshly cooked lobster meat with some mayo, a light touch of Dijon mustard (do you see a pattern here?) a few drops of lemon juice, and some finely diced celery, green onions, and red bell pepper. I buttered the rolls, lined them with some crisp, fresh lettuce leaves from deep inside the head, and spooned in the lobster mix. Served with some thick cut potato chips and dill pickles from Moishe’s, it was simple and delicious! When Martine and I were in California last September, we spent a very pleasant day hiking around Mount Tamalpais with friends, after which we retired to their house high up on a hill in San Rafael for a barbecue dinner complete with a salad plucked from their garden. As an entry to the meal, our host served (among other things) some tortilla chips and salsa from a local shop. The salsa was “roasted salsa,” which I’d never seen before. It was basically regular home-style salsa (read: not ketchupy) except the vegetables had been roasted. It was really tasty, and I think I may have embarrassed myself with the extent to which I tucked in. However, I made a mental note to try making it from scratch when I got home, and I have done so twice since then. Here is my report. The timing in the recipe below is based on estimates; the best thing is to just keep an eye on it and use your judgement. Also, quantities reflect how I like it; feel free to modify to your taste. Remember that the jalapenos will basically dissolve if you over-do it, but the red peppers and onions will get nicely charred with prolonged roasting. I suggest you take things out of the oven as they are done instead of expecting everything to be done at the same time. That’s why I also suggest you arrange things on the baking sheet grouped by vegetable instead of just scattered willy-nilly. With a few slight variations (e.g., olive oil, basil, and less vinegar) this could be a bruschetta instead of a salsa. Note that I do not use lime or any other citrus juice; citrus juice will overwhelm the deep and subtle rich flavours that roasting brings out. For that reason, I use good old basic white vinegar for the necessary acidity. 1 onion, cut in 8ths, and rubbed lightly with oil. On a large, lightly oiled non-stick baking sheet (or two roasting pans), spread the vegetables, grouped together by type. Tomatoes, red peppers, and jalapenos should be skin side up. Remove the jalapenos and garlic cloves – they should be done by now (the garlic cloves will not be as soft as regular roasted garlic, but if you leave it longer it will just burn). Continue to roast for another 15-20 minutes, until remaining vegetables are soft and skins start to blacken. Remove the skins from the tomatoes and red peppers. Take garlic cloves out of their papers. Coarsely chop everything up and combine in a non-reactive bowl along with the vinegar, salt, pepper, oil, sugar, and herbs. Above is what it looked like the second time I made it. The first time, there was more charred and blackened bits, which I preferred. But this time the vegetables were more evenly cooked. Next time I’ll try to hit it out of the park by getting some of it charred without burning the other stuff. Do not oil the steak before you cook it; the oil will burn, leaving a bad taste. Rather, the objective of this kind of steak is the specific allure of rare grilled beef with raw olive oil. Use a good quality olive oil; ideally from Tuscany. Use a Porterhouse steak, preferably at least two inches thick. Let the meat sit at room temperature (covered) for an hour before grilling. After that it’s as easy. Bistecca alla Fiorentina is basically just a really big Porterhouse steak dressed only with salt and pepper, then grilled over high heat until there is a dark outer curst yet the meat is still rare, then sliced, and dressed with olive oil and lemon juice. (Yes, lemon juice.) It’s a nice change from the spicy and saucy American style of steaks we usually eat during grilling season. I doubted I would find any Chianina beef nearby, but didn’t fret as I figured this first attempt was experimental; designed to get a feel for the technique. So I went for regular ol’ beef (I don’t even know the breed). I got the butcher to cut me a nice two-inch thick, 800 gram Porterhouse, and I could tell by the twinkle in his eye that he knew I was up to something good. Let the meat come to room temperature (about an hour out of the fridge, covered). Rub the meat on both sides with a generous amount of freshly ground pepper and kosher salt. Grill over direct high heat for 2-1/2 to 3 minutes per side. Move to indirect medium heat and cook for another 7 to 8 minutes, turning once. Remove the meat from the fire, cover, and let rest for five minutes. Cut the filet and contre-filet from the bone, and slice at a slight angle (to cross the grain of the meat). Dress with extra virgin Tuscan olive oil and freshly squeezed lemon juice. Mark Bittman at the New York Times has published the perfect summer companion: his list of 101 fast and easy (“under ten minutes”) summer meals. I love this list for the obvious “who wants to cook in summer?” reasons but also because I love simple, easy food. We often get caught up in the trappings of elaborate meal preparation in which it takes half a day of kitchen slavery in order to produce dinner, but the best food is often composed of the simplest things; it’s just a matter of having good quality stuff in your pantry and knowning when and how to go “Zen” with it. This is nothing new to me; years ago I picked up Nigel Slater’s book Real Fast Food and it was a revelation. He describes the beauty and simplicity of things like canned sardines and fresh bread. I learned that emphasizing quality and deliciousness is more about what you leave out that what you put in. One of the biggest mistakes I used to make when cooking was always putting everything in every dish. I’d essentially tip the whole pantry into the pot, so all of my soups were the same (except one week it was beef and the next it was chicken, but the vegetables and seasonings were the same) and my pasta sauces were undistinguished concoctions of everything I had in the kitchen. Over time, I’ve learned to do it the classic Italian way of using fewer, but better, ingredients, and of going light with the heat. So sometimes my pasta is all about mushrooms, in which case I don’t use tomatoes (they overwhelm the mushrooms). Or maybe it’s a pasta that’s all about tomatoes, in which case all I add are tomatoes and a bit of basil and some salt. Maybe a bit of garlic. Always olive oil. Or maybe it’s about seafood, so I leave out the tomatoes and the mushrooms and just use lemons and a bit of garlic and shallots. I learned that every time you add something, it takes away from what’s already in there. So add judiciously; or don’t add at all! 40. Put a large can of chickpeas and their liquid in a medium saucepan. Add some sherry, along with olive oil, plenty of minced garlic, smoked pimentón and chopped Spanish chorizo. Heat through. You get the picture. Bittman’s 101 recipes are in this vein; take a few good things, put them together, and never let your dinner forget that it’s all about the shrimp, or the beans, or whatever other few things you put in there. If you ask me, that kind of simplicity is what loving food is really all about; it’s all about the simple ingredients, not so much about the hours and hours of cooking and processing. 56. Make a fast tomato sauce of olive oil, chopped tomatoes and garlic. Poach eggs in the sauce, then top with Parmesan. But that’s not to say I don’t enjoy the results of very involved cooking. Pas du tout! But it’s good to step away from the ol’ hob now and then and take a breather. Eating good quality simple food is like taking a refresher course in what food is all about. 45. Sauté shredded zucchini in olive oil, adding garlic and chopped herbs. Serve over pasta. Summer is the perfect time for this kind of meal because the days are hot, the body is lazy, and the markets are abundant. Who needs to spend half the day fussing over boiling pots? Some of Bittman’s recipes are so simple you’ll be tempted to say “Duh! I don’t need Mark Bittman to tell me how to make that!” But perhaps you need Mark Bittman’s reminder of how little is necessary to make a wonderfully simple and delicous meal on a warm summer’s eve. I’m glad I got the reminder. 68. Brush portobello caps with olive oil; sprinkle with salt and pepper and broil until tender. Briefly sweat chopped onions, then scramble eggs with them. Put eggs in mushrooms.